Game 4 is almost always the swing game in a series. On Friday night the Western Conference Finals swung in favour of Vegas. Eventually you have to wonder if the Vegas Golden Knights are dancing with destiny. Blake Wheeler said it best when he said, "we win that game nine times out of 10." He isn't wrong. He is about as right as you can possibly be. The ever-present leader that is Wheeler has been a quote gold mind in this series, but none more true that one. The Winnipeg Jets put 85 shot attempts at Marc-Andre Fleury. ​That means at least 83 times, the goalie for Vegas was set, ready and played a part in keeping the puck out of the net. Remember, each time a puck goes wide, a goalie has created an angle to make that happen. 85 shot attempts on the road. 85 shots and they lost. Winnipeg finally got some scoring from a man not named Mark Scheifele. Patrik Laine ​scored a huge power play goal at 9:29 of the second period. He was right in his wheel house. Tyler Myers tied the game five minutes into the third as well. As stated, this was a near perfect game for a road team. They only took two penalties. Although untimely and quite honestly, weak calls, one could hardly call either of them complete game changers. At the end of the day Winnipeg just ran into a wall. A wall of destiny maybe... or more literally, a wall named Marc-Andre Fleury. It is one of the oldest clichés in the game; seize your opportunities and you give yourself a chance. Vegas is the most opportunistic team in the league. It is not even been close. Vegas was given an oppurtuunity just 1:55 into the game. With Myers in the box, Vegas scored the all important first goal just a little over two minutes into the game. 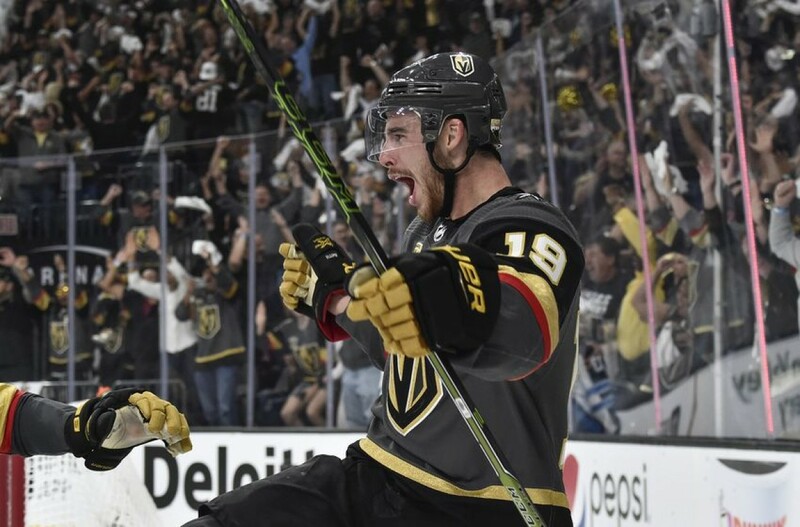 The cross ice feed from Jonathan Marchessault ​to William Karlsson ​for the one-timer was as perfect of a set play on a power play as one can draw up. Just like that Winnipeg was chasing the game. Vegas did not trail in this game for one second. They didn't in Game 2 either. Or Game 3. Vegas also have feasted on Connor Hellebuyck's ​errors. Hellebuyck has been good in this series. Truly, he has made some stunning saves; but not when it matters most. So far, Hellebuyck's puck handling has gotten him into a bit of trouble. In Game 3 he mishandled a puck 12 seconds after a Winnipeg tying goal and James Neal scored to regain the lead for Vegas. On this night it was Tomas Nosek ​who capitalized on a tough play by Hellebuyck only 43 seconds after Laine tied it. That goal should never of happened. On the other hand it is the "big saves in the big moment" cliché that is earning Marc-Andre Fleury such praise this post-season. For example, in Game 3 Fleury let in a weak goal short side to Scheifele. If that happens with two minutes left in the game, that's one of the worst goals allowed this post season. Instead, Fleury dazzled when it mattered most. It was much of the same during this game. Fleury has found the ability this post-season to truly understand the moment. Fleury doesn't need to go through the school of hard knocks. He has been there. Ask a Pittsburgh Penguins' fan. Fleury has been there, with everything on the line, and given up the weak goal. It has happened to him before, but his performance this post-season might truly be the definition of the benefit of experience. Fleury's ability to seize the moment this spring is undeniable and unmatched. Winnipeg was pushing. They looked like they would finally break through. You could tell the belief was growing by ever second. Then a microcosm of the past three games occurred. Brandon Tanev made a beautiful entry into the Vegas zone. He ciricled around the net and saw a wide open Dustin Byfuglien. Tanev feed him the puck right in his wheelhouse. If you believe in having a wheelhouse, this was it. Perfectly placed, just perfect. Byfuglien missed the puck on his slap shot. He just missed it. Nothing more to it. Reilly Smith was right there, as he was preparing to block the shot. He picked up the loose puck, oppurtunistic as ever, skated down the left wing and beat Hellebuyck clean. Bar down, just for effect. Smith hadn't scored since April 30th. It was his only shot on goal the whole game. Like stated; it is all about opportunity. If Vegas can sieze it for another 60 minutes, they have a chance to do something greater than Miracle on Ice ever did. Until then Vegas fans should take a page from Fleury's book and just worry about the next shot.